Austrian actor; born at Vienna April 21, 1849. He was trained for the stage by Emilie Dorr in that city and made his début at the Elysiumtheater, Stettin, in 1868. He then appeared at the following theaters: Budapest and Linz (1869-72), Thaliatheater in Hamburg (till 1877). In 1877 he joined the Meininger Company, remaining with this famous troupe of comedians until 1881, and accompanying them on their tours to Amsterdam and London. 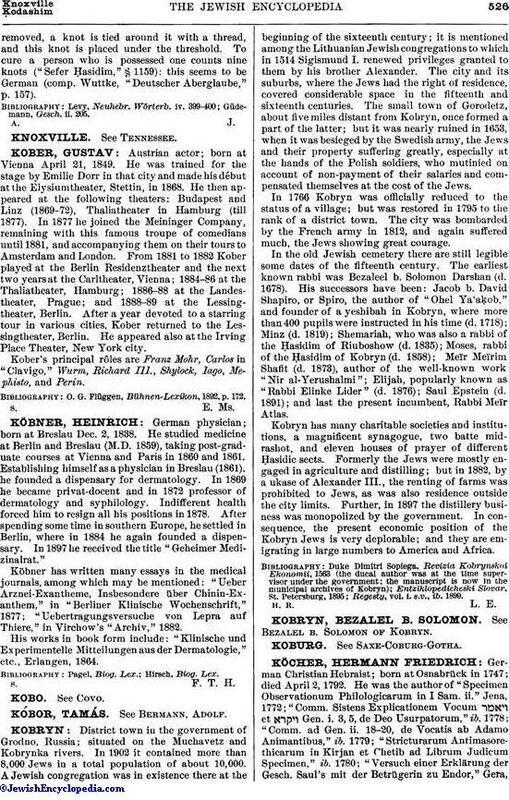 From 1881 to 1882 Kober played at the Berlin Residenztheater and the next two years at the Carltheater, Vienna; 1884-86 at the Thaliatheater, Hamburg; 1886-88 at the Landestheater, Prague; and 1888-89 at the Lessingtheater, Berlin. After a year devoted to a starring tour in various cities, Kober returned to the Lessingtheater, Berlin. He appeared also at the Irving Place Theater, New York city. Kober's principal rôles are Franz Mohr, Carlos in "Clavigo," Wurm, Richard III., Shylock, lago, Mephisto, and Perin. O. G. Flüggen, Bühnen-Lexikon, 1892, p. 172.